"I've known Nazareth for over 20 years as a comedian who brings laughter and encouragement to people. Hope in 24 Hours is no exception This book will encourage you and give you hope." “Nazareth has experienced more than once how God can change your entire life in 24 hours. He has faced challenges and found how God brings the victory. He has listened to God and found God’s promises are real. He has followed God and found his life is better now than he could ever have imagined. I have seen this up close and I have loved that through it all Nazareth has laughed and caused all of us to laugh with him. This book and this man will show you how the “Joy of the Lord is your strength” (Nehemiah 8:10). "Nazareth has an infectious sense of humor and an infectious sense of hope. In fact, his unique gift to make us laugh is what God uses to open the door of our hearts so that we can be invaded with the hope that only comes from above. Get ready to be infected by hope." 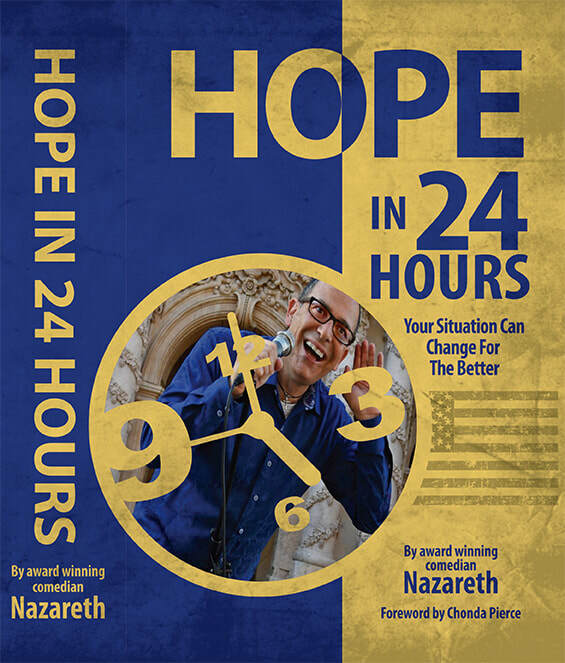 "Comedian Nazareth is both funny and profound in Hope in 24 Hours. He makes you laugh, but more important he authentically points you to the God of Hope who transforms lives and fills us with His hope." My good friend Nazareth has a vibrant relationship with God, seeks to live a life of purity, and loves his family in the way that is a model for us all. What happened to Nazareth, can happen to you. He found a Life Saver and Life Changer in Jesus Christ, and in this book he shares the miraculous ways that God changed his life. In this book, he shares the miraculous ways that God changed his life. May this book inspire and encourage you if you’re looking for what you cannot find, or if you’re looking for a source of encouragement in your own life. I hope you will read this book, and then pass it on to another person who is looking for what you were looking for. ​​​By subscribing, you agree that you want to receive a free digital chapter of Hope in 24 Hours and agree to receive occasional emails from Nazareth and FrontGate Media. You may unsubscribe from these email communications at any time. This page is designed by FrontGate Media.